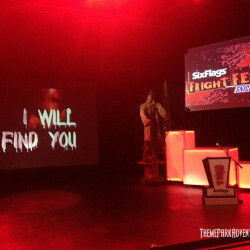 Six Flags Magic Mountain recently offered the media a sneak preview of its 2014 Fright Fest Halloween Event. 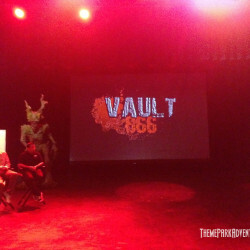 The evening’s preview was divided into two portions – a multimedia roll-out of this year’s mazes, shows and attractions associated with Fright Fest (which was also open to any Season Pass holders that wanted to attend), and then an on-site tour of one of the new mazes for this year – Vault 666 (which was for media guests only). I’d be remiss if I didn’t state that it’s been a long time since Theme Park Adventure has attended a media event of any type at Magic Mountain; even longer when it comes to Fright Fest. Thinking back, I believe the last time I personally attended Fright Fest at Magic Mountain was in 1997; without a doubt, a lot has changed as the event and industry as a whole has grown by leaps and bounds over the past 17 years. 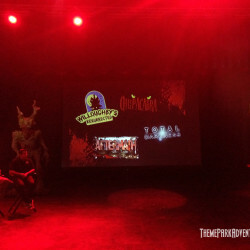 With that in mind, I was one of the only attendees who had just about zero knowledge of the event’s history, Fright Fest’s creative team, or park managers that were part of the presentation. 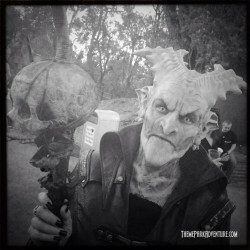 It’s beyond rare that TPA is flying blind when it comes to a Halloween event here in Southern California that’s been around and is as high-profile as Fright Fest – but, there you are. I was – and am – a noob when it comes to this particular event. 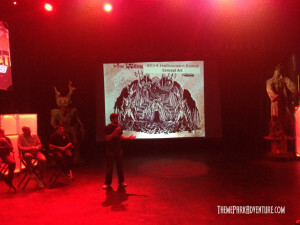 Theme Park Adventure’s involvement in covering Fright Fest came about through Magic Mountain’s involvement in ScareLA this year, which we co-produce. 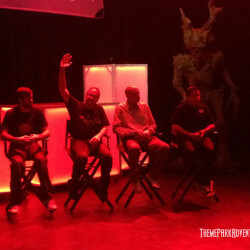 Magic Mountain had a great presence on our convention’s show floor this year, and Scott Ramp, the head of makeup operations at Magic Mountain for Fright Fest, was one of the participants in our unprecedented Making Monsters panel presentation. 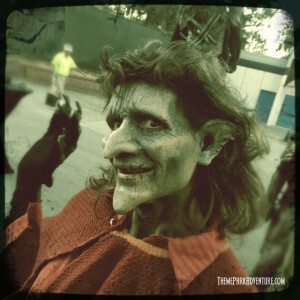 In getting to know Scott, it was apparent that TPA would be adding a visit to Fright Fest to our Halloween 2014 coverage plans. A lot of gratitude is owed to ScareLA for bringing Theme Park Adventure and Magic Mountain back together in a working relationship – that’s something we’re really excited about and looking forward to resuming after a long hiatus. The biggest news regarding Fright Fest 2014, is that this year marks the single largest capital investment that Six Flags has made in the event ever. That revelation seemed to really strike a chord with pass holders and media folks in attendance, as the announcement was met with very enthusiastic approval from the audience. 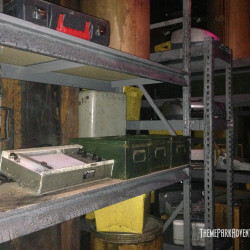 No numbers were discussed, but it seemed apparent that the increase in the event’s budget is substantial – which is always a good thing when it comes to haunted attractions! 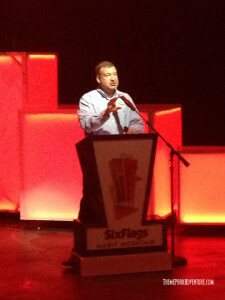 Neal Thurman, Magic Mountain’s Director of Park Operations, acted as the event’s emcee for the evening, and was very well-received by those fans and journalists in attendance. 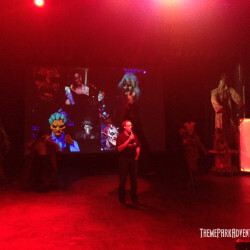 Other managers involved with Fright Fest also involved in the multimedia presentation were makeup guru Scott Ramp, Program Manager Tony Brauner, Senior Events Coordinator/Production Designer Mark Wing, and Fright Fest Producer Scott Sterner. 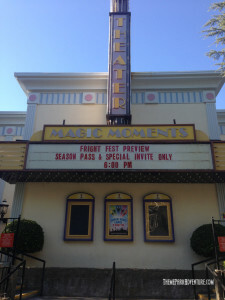 The entire team seemed very comfortable addressing the audience and were absolutely very proud of Fright Fest; their enthusiasm was genuine and rapidly spread throughout the theater as new and old mazes, scare zones and entertainment programming was announced and discussed in great detail. 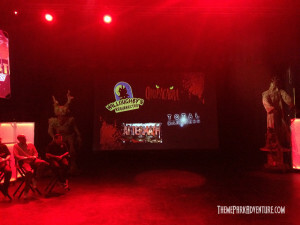 An all-new scare zone named Ravenstitch was announced, described as a Western-meets-steampunk area, populated by sinister scarecrows and raven-like characters, which I thought was a pretty unique mash-up. 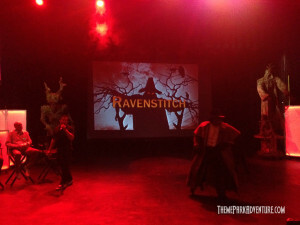 The Ravenstitch announcement was a hit with the audience, and we did encounter one of the raven characters during the second part of the media event – the makeup was nothing short of fantastic and the talent was absolutely awesome. 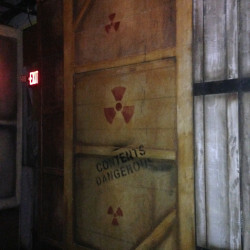 Fright Fest also has what appears to be a “mobile scare zone” that they call the Traveling Scare Squad – it sounds like a “pop-up” group of monsters that can appear anywhere in the park at any time and wreak havoc on guests. Magic Mountain is expanding this team for 2014, which is music to our ears – more monsters = good stuff! 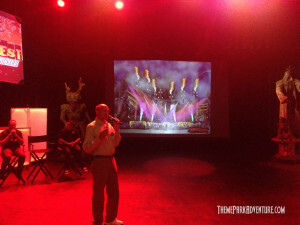 Neal explained that part of this year’s upped capital investment includes new theatrical sets, dazzling special effects, and an overall improvement in quality that everyone at Fright Fest is really excited about. 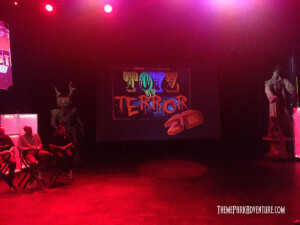 Toys of Terror 3D is one of the new mazes for 2014. As you may have guessed – it’s a 3D maze! Someone in the audience asked if the glasses for this new maze would be an up-charge or free to Fright Fest guests; an unexpected but definitely legitimate question – followed by a “to be determined” response. Personally, I am not a fan of wearing glasses in 3D mazes, so while we’ll end up getting them regardless of whether they cost a buck or whatever, I likely won’t use them for maybe more than a few seconds as we venture through Toys of Terror anyway. I feel that if a park opts to go the 3D route with its designs, they are obligated to offer guests the glasses free to be able to experience the mazes as intended. Here’s where I got a bit confused for a moment… a second Willoughby’s maze was announced for 2014, called The Willoughby’s Garden of Darkness. It too is located at the top of the park, at Samurai Summit; the idea being that now all of this area of Magic Mountain is themed as the old Willoughby property – which, as I thought about it more, is pretty interesting. I cannot readily think of another theme park haunt event that has multiple mazes reinforcing a core theme or story. Not only am I looking forward to seeing/walking through the old Magic Pagoda building again (I’ve been told that all remnants of the old fun house-style attraction are now gone, sadly – some were still there in ’97), I am really curious to see how the second Willoughby’s maze carries that theme forward in a cohesive story line for guests. 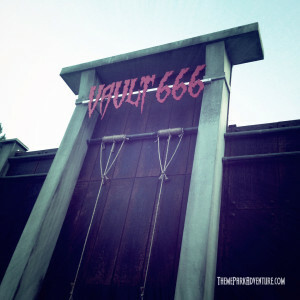 Vault 666 is another new maze this season, that puts guests in the middle of a terrifying genetic experimentation lab – kind of like a haunted house version of The Island of Doctor Moreau with an industrial twist. This was the maze that members of the Six Flags Magic Mountain team took groups of us through to preview. And it was strictly that – a lights-on tour of the maze nearing completion, void of any sound effects, musical tracks, live talent or active show lighting/effects lighting. Not being at all familiar with previous years’ mazes at Magic Mountain, I had nothing to compare it to. Vault 666 looks like it’s going to be a fairly elaborate, high-intensity maze when all is said and done; Scott Sterner and Mark Wing led groups through that I was part of (yeah, nerdy me went through twice), and both were really excited about the product. We look forward to coming back and seeing Vault 666 in its full glory this Halloween! 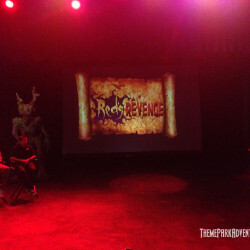 The new maze entry that Magic Mountain made a really big deal about during our presentation is Red’s Revenge. 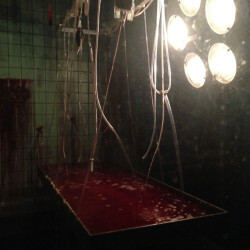 The theme is a twist on Red Riding Hood, pitting the girl against town folk and the wolf – and inevitably us as guests. What makes this maze particularly important for Magic Mountain is that it’s the most detailed and elaborate haunted house they’ve ever presented at Fright Fest. 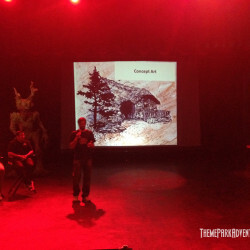 Concept art shown to the audience depicts large, really impressive sets – with the promise of Red’s Revenge raising the bar to become the “new standard” for Fright Fest in years to come. This is really great to see, and absolutely the right way to think about the event’s evolution. Mazes and even yard displays around the United States are becoming more and more polished and highly-detailed each year; the quality of mazes we’re seeing at the theme park level are mind-blowing. 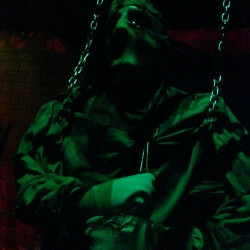 Six Flags has to keep up with the Joneses – especially in Southern California, which is the most aggressive haunted attraction market in the country during Halloween. 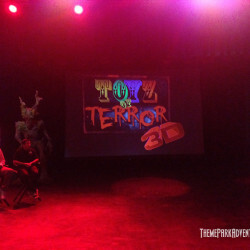 Fright Fest features a good variety of shows and entertainment as well – something that other theme parks in the region have throttled back on partially or fully this year (a big mistake, in my opinion – ya gotta have shows… that’s “theme park design 101” stuff). During the day (more on that in a moment), younger Fright Fest guests can participate in arts and crafts and more family-friendly entertainment throughout the park, including trick-or-treating. Once the sun goes down, and the event takes on a more sinister tone, adult entertainment is going to be available. VooDoo Nights is going to be Magic Mountain’s high-energy show/night club/hang out area that will feature a cast of about 20 performers and continuous entertainment throughout the night starting at 7 P.M. In my mind, it sounds like VooDoo Nights is going to be the Fright Fest version of Disney California Adventure’s Mad T Party. And that’s not a bad thing! VooDoo Nights sounds like it could be very successful, and we’re looking forward to seeing how the park executes this large-scale entertainment venue. Voodoo certainly in the new “haunt bacon” this season, it seems – everyone loves it, and everyone has to have it as part of their offerings; perhaps an industry-wide memo went out… Thou shall Voodoo… Or, maybe everyone just is still basking in the geeky afterglow of American Horror Story. Fright Fest at Magic Mountain continues to be a single-ticket event. Guests can come during the day and stay late into the night without paying separate admission. 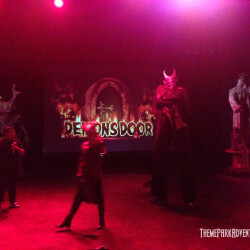 This is completely different than any of the other theme parks in Southern California, which each offer separate ticket events during the haunt season. I asked Mark Wing about this, and he explained that the single ticket admission is a value that Magic Mountain believes its fans appreciate and take advantage of appropriately, with families coming during the day and older kids and adults showing up once the sun starts setting. I get that. I may have more thoughts about that once we visit the actual event itself this Halloween season. 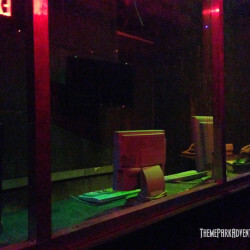 Until then, I will keep my thoughts to myself and see how it all plays out in person; I’ll revisit this business model when we fully review Fright Fest 2014 later this year. Editor’s Note: Entry to Fright Fest’s mazes requires a wristband, which is an up-charge for those already in the park if they choose to check out the haunted houses. Throughout the theater presentation and later mingling with members of the media, Fright Fest monsters of all shapes and types were on the prowl. Scott Ramp and his team need some serious recognition, and Theme Park Adventure is going to give it to them in full. 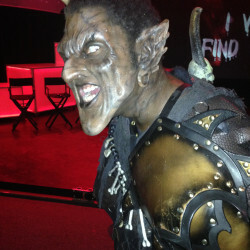 The makeup jobs for the handful of monsters that we encountered during the media event were fantastic. And I can say after seeing the work that Scott and his team did all weekend long at ScareLA this year – it’s no fluke. What makes the Fright Fest monsters even more impressive is that they’re spot-on with their acting and guest engagement, and their flawless makeup delivers a one-two punch that is stunning. 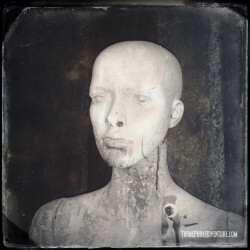 Most haunted attractions rely on the darkness to help cover up imperfections and shortcomings. With Fright Fest, these creatures are designed to be seen in bright sunlight – and they have to look picture-perfect from all angles. From what we’ve seen so far, we’re quite comfortable in saying that Scott Ramp’s makeup work is some of the best we’ve ever seen; and that’s saying a lot. Take your cameras to Fright Fest, because the monsters – if they’ll pose long enough for pictures – are world-class and should be celebrated by fans everywhere! 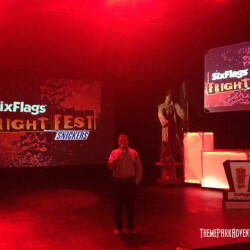 And that’s it – a report on what we were shown and told to expect in a month or so when we return to experience Fight Fest 2014 at Six Flags Magic Mountain. I thought I would be at a loss for words since I am really completely unfamiliar with this particular event – however, as we’ve blurred the line between reporting and commentary, I think it’s all come together quite nicely. Theme Park Adventure thanks Scott Ramp, Mark Wing and Sue Carpenter for placing us back on Magic Mountain’s radar after a long absence; we are truly pleased about that, because Magic Mountain is a very important part of California’s theme park history and we have grown up with it our entire lives. We look forward to attending Fright Fest 2014 and cannot wait to share what we find with all of you – it’s going to be a really exciting, brand-new experience for us! We encourage our TPAers to check it out as well – whether it’s mazes or makeup you’re into, one thing is for sure – Magic Mountain is going to pull some major moves this Halloween season, and we’re more than ready to witness it! 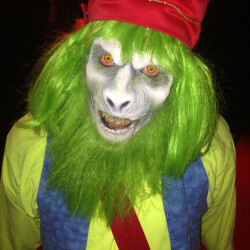 This entry was posted in Haunted Attractions, Home Page, Home Page Slider, News and tagged Fright Fest, Scott Ramp, Six Flags Magic Mountain. Bookmark the permalink. Even though you can stay and enjoy most of Fright Fest with your park entry ticket, you should be aware that the mazes do require a special wristband for entry, which is sold for an additional fee. Don’t get caught off-guard when you get there and find out it costs more to go through the mazes. Ah! See! I am a noob! I will note that in the story – thanks for the heads-up! It would have been MUCH easier with press release material explaining the event, ticketing, etc! Will there be special ticket sales for the event, or do you need to purchase a regular admission + the wristband upgrade? It’s getting close and I cant find any information on this. 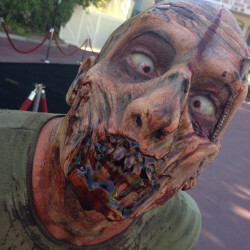 As far as I know – guests with regular Magic Mountain admission during Fright Fest can partake in the park-wide events. It appears that you must buy an up-charge wristband to enjoy the haunted houses, however. I don’t have much else to add, as I haven’t been for 17 years! This is all new to TPA, so we’re kind of in the same boat! 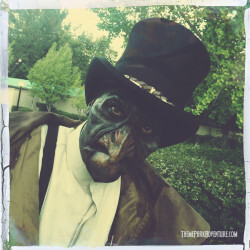 Hopefully, Magic Mountain will put up pertinent information ASAP on their site, since Halloween season is HERE.